The Expedition 43 crew continued their work on Wednesday with a variety of research and technology demonstration activities. 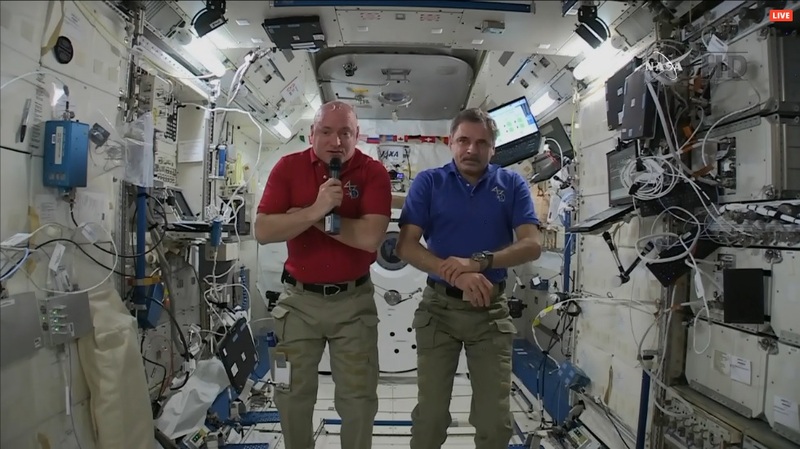 NASA astronauts Scott Kelly and Terry Virts studied the effects of microgravity on living organisms for the Rodent Research experiment. They are looking at mice and how their body systems change in space. The results may promote the development of new drugs tackling the effects of aging and disease on Earth. Meanwhile, ESA (European Space Agency) astronaut Samantha Cristoforetti continued operations with the Triplelux-A experiment and adjusted imaging equipment on the Electromagnetic Levitation study. The crew was also notified in the morning that the planned docking of Progress 59 has been called off. Both the Russian and USOS segments of the station continue to operate normally and are adequately supplied well beyond the next planned resupply flight. Russian flight controllers are continuing to assess the vehicle and what the plan going forward will be. More information will be provided as available.